The Flagler County Sheriff’s Office made it official today: Cmdr. David Williams, who’s been with the agency since 2001, was named the liaison to Palm Coast, replacing Mark Carman, who’s to be the police chief in Crescent City. Williams’s announcement was expected, and was originally reported here on Jan. 2. But the appointment had to be ratified by Palm Coast, which pays the liaison’s salary. The position as Carman held it on and off for two decades (his title and bosses changed a few times along the way) was often seen to be similar to that of the Palm Coast precinct’s chief. But a different commander, Gerry Ditolla, oversees the Palm Coast District and its deputies. The city contracts with the sheriff to provide policing in Palm Coast, paying for those services as well as for the liaison’s position. Affable, highly visible and often seen on his motorcycle in the past, Williams will also be responsible for special events from the sheriff’s perspective. He previously served as the Sergeant of the agency’s Motor Unit before being promoted to Commander over the Community Outreach and Crime Prevention Unit in 2018. He has participated in countless community events. 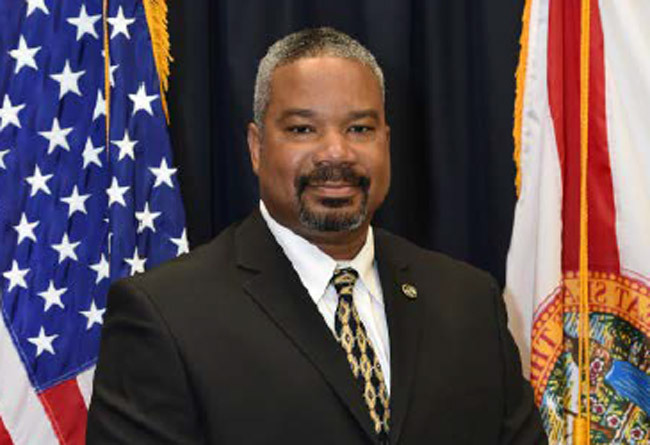 Last spring he graduated from the Florida Department of Law Enforcement’s Leadership Academy. The quality of that relationship is no small matter to the mayor: The council is currently reviewing applications from city manager applicants as it seeks to replace Jim Landon, whom it fired last year. During a four-hour discussion on applicants today, one application drew Holland’s attention: that of former Sheriff Jim Manfre. Holland then all but vetoed the application, saying Manfre doesn’t have a good relationship with the current sheriff to make his application viable. Cingratulations David. Great person to have around. Congrats Cmdr. Williams. And Thank you Mayor Holland for realizing Jim Manfre is not a fit in the palm coast government puzzle just as he wouldn’t be in the county administrators job he also applied for. Does anyone get along with sheriff Staly? He wont talk to people or refuses to communicate. Maybe if they start bowing in his presence he will speak to them. Congratulations Commanded Williams you will be an asset to the city in your new position. Enjoy the meetings! A class act! Congratulations Dave. Couldn’t ask for a better guy. Way to go David. Congratulations David. Wishing you the best. Commander Williams is a wonderful guy. Pleased he is moving up. Sheriff Staly leaves a lot to be desired. He never met a microphone he did not like. Cannot wait to vote against him when he runs for re-election. Congratulations Commander Williams. Your professionalism and hard work is an asset to us all. Congratulations Commander Williams! I’m certain that you will make a great liaisons to the City of Palm Coast as you’ve served our community with with the utmost care and professionalism. You are certainly deserving of this appointment! Dave, I’m sure you will do a great job of keeping the city happy. Just pay more attention to detail then you did when you took over the motor unit and you will do fine. Congratulations on your new job! What a pleasure it has been to know you! You deserve all the best!